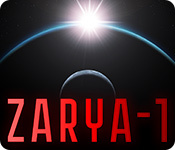 ZARYA-1 is an interactive fiction game that takes place on the far side of the Moon. You are tasked with supervising a team of four specialists to locate and explore the source of a mysterious signal. Your decisions will matter - but the consequences aren't always clear and sometimes disaster will happen. Every choice you make will give you a slightly different perspective on the events that will unfold - and with it, another grain of the truth. Will you be able to piece together the whole story? Zarya - 1 is rated 2.3 out of 5 by 29. Rated 5 out of 5 by moodyree from Intriguing adventure game A throw back to the choose your own adventure books I read as a kid. The big thing you have to know about this game is its text based, so lots of reading, don't expect to see anything but text. Have read several reviews slamming it because of that, sorry THATS the point of this game, it actually makes you use your imagination, something most games today don't make you do. Dialogue can be a little slow at times. Lots of choices to make to get your crew killed (I have yet to get them home). A few nice twists in the story lines. A nice change of pace from point and shoot, and hidden object games. Well done Big Fish, more like this please. Rated 5 out of 5 by greengoosepumpki from Old school text adventure meets modern fx I am sooo tired of Hidden Object and Time Management games. I love that Big Fish is coming out with the modern versions of old genres. This game has a very engaging storyline! Rated 5 out of 5 by Kirland from Out Of This World! Very interesting game. I really like it. Reminds me of Lifeline. So far I am not have very much success in the various paths I am taking. I am having a great time exploring with the Mission, trying to keep them safe and to get them home safely. These adventure games are refreshing. Although, I do like the fantasy and beautiful graphics of so many of the games Big Fish offer; it is nice to have a change. I love science fiction adventure games. Keep them coming Big Fish. Rated 5 out of 5 by pcpat923 from MOON SCIENCE FICTION, OR IS IT? Please do not give away the story in your reviews! Yikes! Less is more. Demo Review-- I'm impressed with the overall presentation. Thanks, BFG for including this unique gaming release. Unlike 99.99% of the usual games presented, this is more a visual, interactive novel with a riveting story line. You are the Commander ordered to oversee a 4-man astronaut team. Goal--attempt location of a signal source on the moon's surface. Your decisions affect the crew and players can return to a dialogue point with possibly new directives for new outcomes. I didn't get a chance to look at much else as the overall display was so intriguing, the demo time ended. Without question, this game is a buy for me. 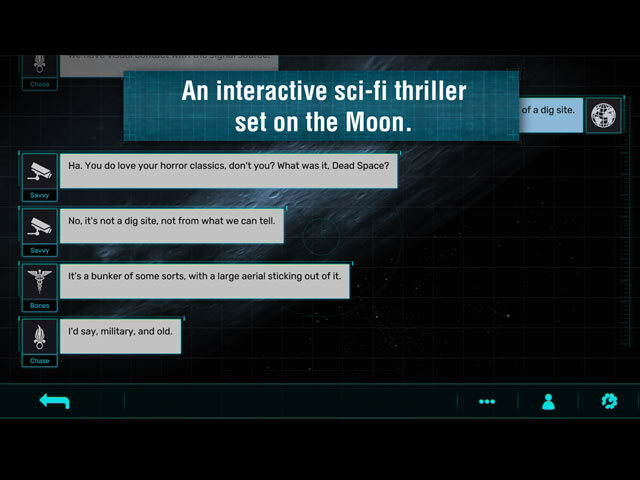 Admiration and a big thanks to the game developers who nailed the moon conspiracy/controversy mixing fact with fiction. Or, is it? Enjoy! Rated 5 out of 5 by SparkleGlow100 from STUNNING, FANTASTIC STORYLINE in this GRAPHICAL-TEXT BASED THRILLER. NO HOPS, NO POINT & CLICK, NO PUZZLES, NO 3D or 360 Available at BFG since 2017. Review based on several hours of gaming. 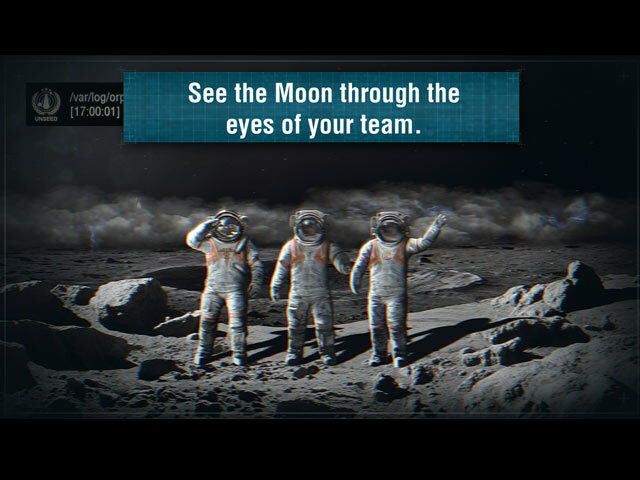 You are the commander of a particular moon mission. For the story to progress, there is constant communication between you and your team, including photo updates. The communication appears as typed wording. Tension builds in the storyline as witty banter gives way to exhaustion and confusion. Rising fear must be subdued and the mission completed. How you respond to the team questions and scenarios, and how you decide to proceed at each stage, will affect how the game unfolds. If you have a catastrophic fail incident, the game allows you to rewind to a previous stage and choose different options. It isn't a difficult game to play, it's an experience. The sound-effects and simulated computerized glitches and interference create the perfect environment for the game. Although there are no scenes with detailed graphics and no voice-overs, it really felt no different to watching a great sci-fi movie or reading a fantastic book. It was very difficult to stop playing and drag myself away. A lot of the tension is created by pauses in communication between what is being attempted or experienced and then what actually happens. Thanks for having this game on BFG! Rated 5 out of 5 by sealsbroken13 from More of a story than game,but what a story. The description of the game explains it well. When I first tried it I did not last long and so rewind time and I love this game because I am into good stories (normally in books and movies) I loved the fact that every time I re-winded the story it gave me a little more insight as to what was going on as well as built even more mystery,I kept playing until the free trial shut me off (a real rarity for me.I bout the game played for hours and still have not run out of story. If there is one draw back I would say it does not let you skip conversations fast enough. If your not into great stories but game play only skip this game,but if you are then this is a great game can't wait to see if they come out with one for mars. Rated 4 out of 5 by Just_Joie from Interactive Space Novel This is strictly a text based interactive novel where your decisions and responses drive how the plot unfolds. If you enjoy a good read, this is your game. It has a great plot and is a lot of fun. If you don't like reading or needing to use your imagination as it moves along, it is not. There are few pictures, the imagery flows in your own imagination as you read and respond. If your ability here is limited, it is going to be very dull and slow and will not make you happy. For those who enjoyed LIFELINE, this is similar, though moves a bit faster. I found it less immersive, perhaps because I did not feel I was there, but was safely away somewhere else simply texting to the team who was at risk. The sequels also got to me more so, because I knew the threat and felt more invested. That is lacking for me here a bit. I can't say why. Maybe it is because this has fewer descriptions and expressions of personal feelings. Even so, Zarya was a good tale. LIFELINE got a 5 off me, this one fully deserves the 4 I gave it. It is nice to see a few text based games turning up again in the industry. I do not like most HOGs, and I actively dislike most match 3 games, so I do not review those types of games unless something about it really was exceptional. Zarya does not deserve the flood of low ratings it has been given. It is quite good and involved for the style it has been created in. It could have described more and given a bit more for the imagination to work with, however. Rated 4 out of 5 by pennmom36 from THE ORPHEUS MISSION I get it, this game can be quite boring if you don't like to read endless dialog conversations. This game is very similar to Lifeline, however, with this game, you don't have to wait in real time for missions to be completed! The first few minutes of the game are very boring, but I stuck with it, and discovered that it has an amazing sci-fi storyline, and likeable characters. The best part about this game, is that you are in control of the mission, the choices you make, really do have an impact, and the choices you make, could get everyone killed. (you know that sounds cool) Zarya-1 begins with a confidential encrypted e-mail from United Nations Space Exploration and Exploitation Direct, also known as UNSEED. You have been given a new assignment as Liaison-in-Command, sent to investigate an unidentified signal coming from the far side of the moon. Your team includes the leader Sarg, camera technician Savvy, doctor Bones, and my personal favorite character, Chase, the wise cracking civilian weapons and defense guy. I'm not sure if the Star Trek references are intentional (Jim, Bones etc) or coincidence. You don't need to do anything other than read the dialog boxes and choose which questions to ask or directives to assign. Other reviewers have stated that the dialog moves way too slow, but if you go into the games settings, you can choose the dialog speed. This game will utterly bore you if you're not into reading, because there's nothing else to do or really see, but if you don't mind reading and decision making, the storyline is a fantastic sci-fi, is it humans or aliens plot! Unlike the game Lifeline, which is the same exact concept, that requires you to wait for hours at a time for missions to be completed in real time, Zarya-1 gives you the opportunity to Fast-Forward the time frame, or if you prefer, you can wait, sometimes as long as two hours. The really cool part, is that IF you fail the mission by making the wrong decision (yep, I somehow managed to get everyone killed) this game allows you to Rewind the mission and start over. You can either rewind to the very beginning or to a later specified spot, allowing you to make different decisions that will hopefully change the outcome. This obviously isn't a game for everyone, there aren't any puzzles to solve or inventory items to collect. There aren't any fancy graphics or cutsie helpers. There's just a black screen, with lots of dialog texts to read. Again, if you don't enjoy reading, you're going to hate this game. But if you can look at this as more of an interactive sci-fi online book, I think you'll find the storyline fascinating, so keep an open mind and enjoy! Rated 3 out of 5 by marg6043 from A different type of game for sure After reading the tittle of the game I wanted to give it a try, very different of what I am used to play. No much on the interaction side, beside clicking for answer choices and a lot of reading. I am sure is somebody out there that will like this type of game, sadly is not me. Rated 3 out of 5 by odarney from For once, I'm not sure....way too slow This game starts off soooo slow, painfully slow. All that happens for like 20 minutes is radio chatter; no visuals, just chatter. The concept of this game is outstanding! But it should have started off with at least a few visuals and not just the written word. I got so bored....but, I'm going back in to see if ANYTHING happens.